Having ultimate control from wherever you are is exactly what the Memphis Grills Elite 39-inch Pellet Grill Built-in model# VGB0002S unit offers. This amazing grill allows you to monitor and control temperatures through Wi-Fi and their Intelligent Temperature Control program. This pellet grill is proudly constructed in the USA and offers you a great way to grill in your backyard, on your patio or deck area. The pellets are about as expensive as a propane gas tank would be and allow you to cook for just as long. They burn slowly and provide a great way to cook your favorite meats and vegetables. Have you ever wanted to know what the grill was doing without having to sit outside the entire time you’re cooking? Now you can with the Memphis Grill Elite. 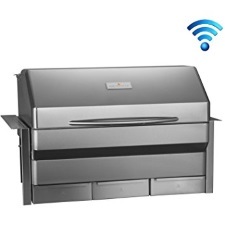 This new grill offers Wi-Fi control through the Memphis Mobile App. This grill app allows you to monitor your cooking temperatures even if you’re in your home resting or if you’re working on another project. You can confidently cook your favorite meats and veggies without having to stand over the grill or constantly run out to monitor the temperatures. You can have your meals cooking while you’re at work or at home. With the app, you can easily check to see how the temperatures are holding from anywhere you are. The best way to get tender, juicy meat every time is with the patented dual convection process that the Memphis Grill offers. This system provides a convection type cooking for your meats on the grill without you having to constantly monitor it. With the convection system, you can rest assured you’ll have even heating circulation throughout the entire cooking process. When it is evenly heated, you can bet your meats will come out tender and cooked perfectly every time you use the grill. Whether you’re making a delicious roasted chicken or steaks and shrimp, your meat will come out just the way you like it without worrying about the risk of burning or overcooking. The Memphis Grills VGB0002S Elite 39-inch Pellet Grill Built-in model currently has 5 customer reviews on the Amazon website at the time of this writing. There are other reviews on sites that are all in favor of this grill and the 5 on Amazon gives it a total of 5.0 out of 5 stars. The reviews on other sites are also highly favorable in purchasing this model grill. The main concern for some may be the price on this particular unit. On multiple sites, the grill costs over $4,500.00 so it’s something you need to understand your investment. On the whole, there are not many negative reviews out there if any that were found during the time of this writing. Those who have purchased this unit say … “Best grill ever” … “Best machine ever made” … “It is amazing!” …” I use this in my restaurant” … “Five stars!” … “Great customer service” … “The food comes out tender and juicy every time”. In summary, if you’re looking for a machine that allows you to cook a variety of food items on your time, then the Memphis Grills Elite 39-inch Pellet Grill Built-in model is for you. It allows you to cook from 180 degrees up to 700 degrees with ease and convenience. Use the mobile app on your Smartphone to make sure your grill stays where you want it to so that your meat is tender and perfectly cooked. No matter where you are you can know what your grill is doing with the Wi-Fi connectivity and the amazing pellet grill convection cooking. Whether you’re cooking for family and friends or a whole block party, you will have ample room on this fantastic model.